Happy Friday!!! Today feels extra sweet, and I'm not sure why. I was supposed to go to Cleveland on Wednesday for work, but the meeting got canceled so my week was pretty chill but having the weekend here is still quite exciting! Maybe it's the holiday weekend and all the crazy sales that are keeping my spirits up! I dunno! But let's get started! And as always, for my sanity, I'm only linking to items that are still available. Layers are still a necessity right now, even though I don't think the weather has decided what it wants to do yet! 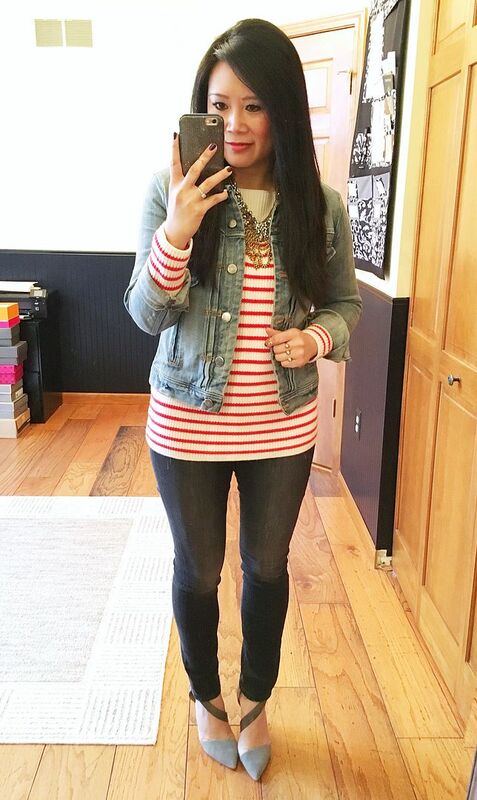 This sweater will be great with shorts in the summer, but I loved it as a bottom layer with my denim jacket! And these pull on leggings! They're the same pair from yesterday's blog post. I just cannot stop wearing them. I am bummed because they didn't have the other wash in my size. Ha! See, I told you. Here are the same jean leggings. I can't help it! 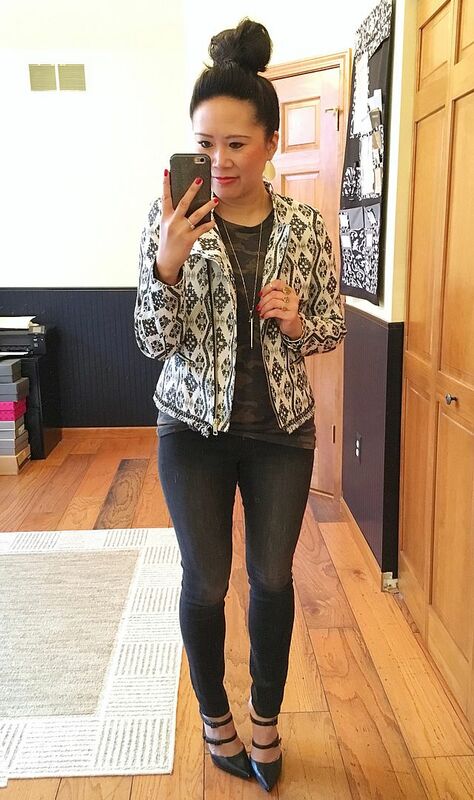 This was a really good outfit - I loved loved loved the subtle pattern mix with this top and the jacket. You can see it better in the top down view here. I stuck this outfit in here even though it's basically the exact same as this post here. 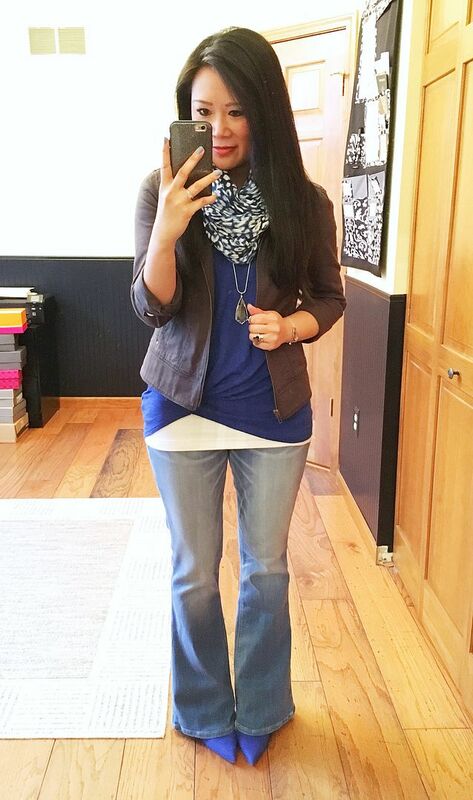 I just switched to non-destroyed jeans for work, and then obviously the hair. But I photographed a selfie mainly because I loved the way the earrings popped against the rest of the outfit. I'm not going to lie. I still feel a little bit weird wearing flares. I do love these as well as the outfit, but this is still the only pair of flares I've bought. I might try a darker wash with a skinnier leg. Maybe. Express is 40% off right now, so maybe I should! I have started to braid my second to third day hair at night and sleep on it. The next day when I take it out, my hair is nice and fluffy and wavy and I just love it. I take a curling wand and spot curl it in places that need help, but otherwise, it's such a super fast hair style and I seriously love the way it looks. It's been my favorite way to do my hair lately! But anyway - this outfit! I had just gotten a pedi for the first time in FOREVER and needed to wear all my open toed shoes. 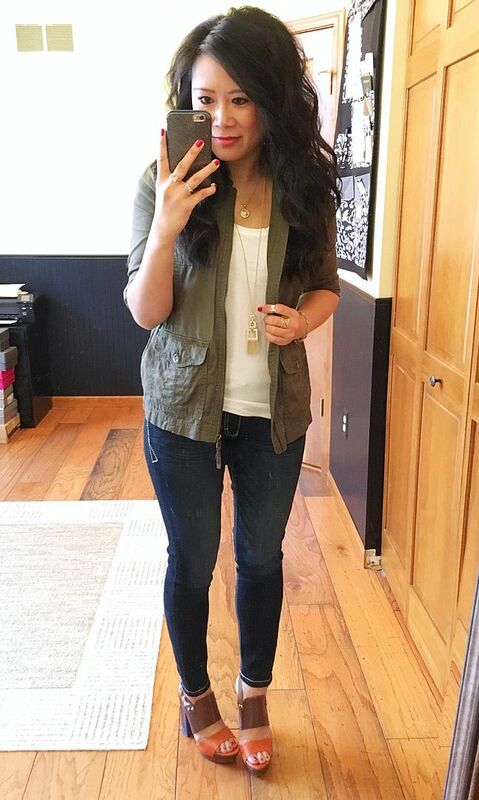 These sandals are an old favorite and I thought they complemented the olive jacket perfectly! I honestly don't think I wore them at all last year, and I don't know why. They're fab. OK, before I leave you, I've put together a quick list of all of the weekend sales that have me tempted. I'm really trying my hardest not to shop. So far I've only ordered this skirt from Express, but I know it won't be my only purchase this weekend! Let me know what you're buying! Have a great Easter!!! 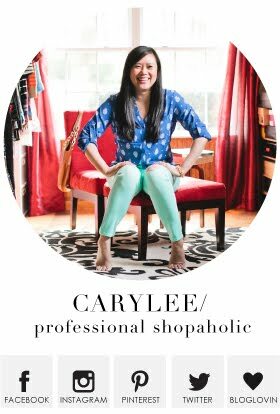 JCrew Factory - 50% off (prices marked) and extra 40% off sale using "EGGSCELLENT"
Always such cute outfits and love your hair when you sleep on it braided! Looks super cute. Hope you have a great weekend! Okay, I just added the pull on jean leggings to my Express shopping cart. I love the wash on them. 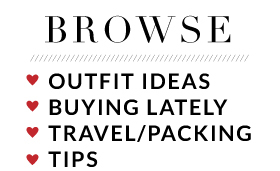 I have about 186 things in my cart though so something will HAVE to get edited. I appreciate your honesty about flares! Such a fun roundup as usual. 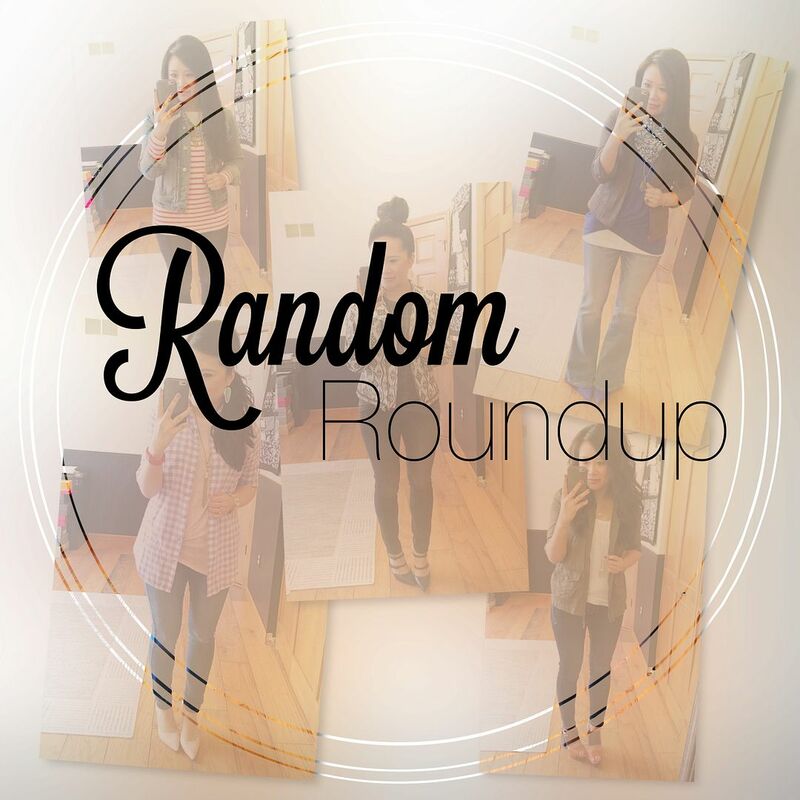 Lots of great outfit and shopping inspo! 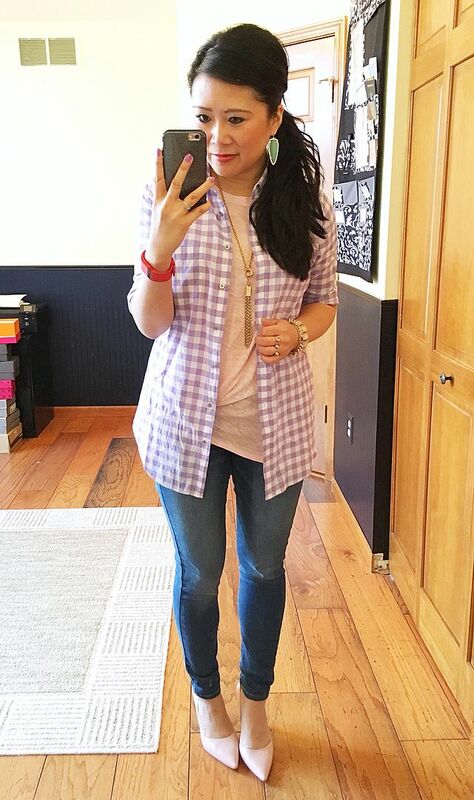 You have such a great way at styling outfits that are actually wearable in everyday life. I always love coming to your page and getting inspo. Your snaps on your fitness game are also inspiring me.